In Uncharted 4: A Thief's End, you play the role of smart treasure hunter Nathan Drake once more. Unfortunately, it is his last adventure but it can be quite impressive: you can expect action at its best, numerous puzzles and climbing and jumping passages that have to cope with to find the pirate paradise Libertalia. - Climb and Jump passages: In the game, you have to climb numerous houses, cliffs or ruins or jump on them. For this you can also use various aids, such as a cable or a grappling hook. - Shootings: Battles are also not too short, even if it takes a few hours of play, you are allowed to preparer for the first time. In Uncharted 4, you can also gradually be successful. Here the game offers you even more opportunities than in previous games. - Puzzle: There are tons of riddles in Uncharted 4. They are not really a challenge but provide variety and are also staged graphically opulent. Incidentally, there are now decision options. Although these don’t affect the story, but it's not so bad to be able to determine answers now. The paths are not as linear as usual this time. In between you enter even fairly open areas that can explore by jeep and other means of locomotion. Of course you will also find numerous treasures and collectibles. These get you certain activation points that you can use in the gallery for the 3D display of the characters, or the concept drawings. - 25 days book entries, which are marked with a magnifying glass and they can be useful in riddles (you get them often automatically during the game) and 23 days book notes in the form of hidden letters and notes with background information. - Take the time to perform a total of 36 dialogues with your companions. You should always keep an eye on and pay attention to their actions. Some discussions can also be enabled only in certain places. - If you are traveling with a vehicle, it has a winch to the bumper which you can attach to trees or rocks to pull the jeep over rough terrain. - The drivability of the jeep changed depending on the terrain (asphalt, mud, grass). 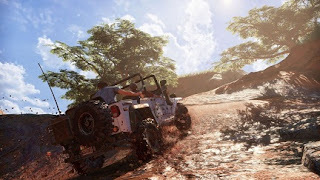 - Fortunately, the Jeep cannot be destroyed, even if there is a damage model, so you can make as many accidents as you like ... well, unless you rolled over a cliff, then you die. - To set the camera behind the jeep, you have to press the direction key of the Digi-pads down. - Objects and places where you can climb up are marked in colors so they are easy to identify. - If you encounter enemies, then fill up first a white bar over their heads when you step in their field of view (the enemies suspicious). The bar turns yellow when the enemies of go closer to the bottom. The fight starts only when they then discover you. - Use the rope for climbing: With it you can swing across ravines or along shimmy and rock. But you have to jump at the right moment and let go of the rope to get to the next point. - Use the grappling hook to climb: Also this tool is new. You receive it after halfway through the season. Ram it into porous surfaces to climb objects better. - By destination tag you can also see where your last bullet struck. - Ensure that your accompany NPCs assist you in battle, make this advantage. - Nathan’s speed always adapts to the situation, so that you cannot usually decide when he sprints. But in the battle he can sprint, he also makes and remains constantly on the move and dodges. - Attempt to reach enemy silently / unnoticed and launch stealth kill from the balcony or from tall grass and hide them there. Thereby you can also unlock trophies and achievements. - If you decide to play the game in difficulty or extremely difficult, then you expect new stronger opponents. - If you suppressed simultaneously the analog stick R3 and L3, then you can use a photo mode. Having trouble climbing using grapple hook, any tips?